Oh my lord, never have I ever watched an anime knowing that it would be bad and still have the desire to watch it as much as I did than for Glasslip, whoops I meant Floplip (sounds much better). I honestly don’t know where to being to compose the words to form a sentence to summarize my unbarring thoughts for this anime, or even found the power for finish this anime in one week. I have never seen paint dry before but I might have to check it out since it might be more interesting than the 13 episode saga of Glasslip. With the success P.A. Works had with Nagi Asukara, fans of the production company were excited to see what P.A. Works would produce next, and that was the flop known as Glasslip. With every episode I kept asking myself, “What on Earth is this anime about?” I thought I had an answer as I got into a few episodes but my faith in what I thought was the plot failed me. At first I thought it was a love triangle – this was not it. Then I thought it was able two psychic lovers predicting the future about people in their inner circle through glass – this was also not it either. And as I came closer and closer to the end of this anime, it just got more confusing and I officially lost hope and just wanted to cross this anime off of my completed list. Characters….lol. 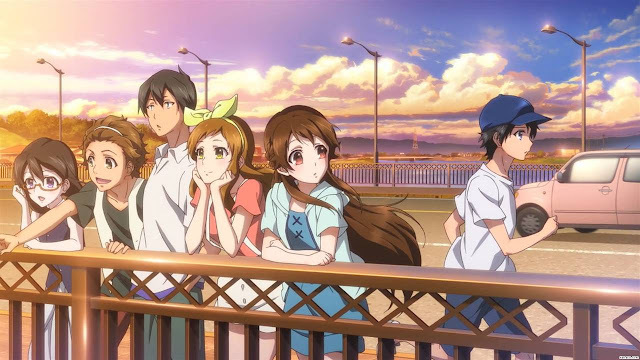 If you’d ask me to summarize the cast of Glasslip, that’s what I would say, “lol” because the characters are lol-worthy. Kakeru Okikura literally plops out of nowhere and joins a group of friends at a cafe and the story continues from there. He comes off as this passive aggressive type of person and just has this bland personality that makes him unlikable – not like any of this friends in his newly established “circle” are likeable either. Seeing him get slapped by Yanagi (one of the people in his “circle”) was the best moment in the anime. Points for Yanagi slapping him but she’s not off the hook either, this lady needs to get a boulder dropped on her because she’s just as boring and stupid as Kakeru is. And what the hell was up with the scene where she walks around the house naked? Like what on Earth was the point of showing that? I'm at a lost for words since the rest of the characters are as stupid, if not more than these two. I think the only positive thing I can say about this anime is its animation and music. Glasslip is animated beautifully and the character designs were aesthetically pleasing, I’m sure no one can argue about that fact. The music is not too shabby, I couldn’t tell if they had an OST – and I do not want to research that since I don’t care for this anime. But the ED song choice was nice, so was the OP. Ok P.A. Works I guess you deserve some credit for your animation/artistic abilities. Overall I would not recommend this anime to anyone since you would probably end up staring at the screen for 90% of this anime not knowing what the heck is going on! This was a big waste of 5 hours I wish I could get back. I feel as though the writers just decided to throw a bunch of ideas for the episodes of Glasslip into a box and actually went through with producing whatever went through their heads instead of sitting down and writing a good story to animate. Just don’t watch this anime. Please. Anyways, if you read the review and agreed/disagreed with me, please comment down below and tell me your thoughts on Glasslip. Thanks for reading!